Just getting back from vacation here is a Best of the Tales repeat post. This is one of my early classical music posts on the Tales classical music weekends from a few years ago. Hat Tip: Idea for today's selection comes from my tribble friend Joel, @Joelmt in a tweet to another good tribble friend Carolyn @strongthought. Thanks Joel and Carolyn for being loyal readers of my classical music weekends on the Tales. Both Joel and Carolyn, great aficionados of classical music, are from Portland, Oregon. Johannes Brahms, the great German Romantic composer is one of my favorite composers, especially his orchestrations with its dynamic powerful sounds of beautiful melodies. His four symphonies are some of the greatest in the symphonic repertoire. Outside of his symphonies, Brahms "Variations on a Theme by Haydn" is one of my favorite pieces by him, and one of my favorite pieces in all of classical music. It is a beautiful piece of music. Brahms scored it first for two pianos and then for orchestra. Because I love both versions, both you will get. You will see this piece does lend itself well to the piano, although I still prefer the orchestral version. You may choose different. 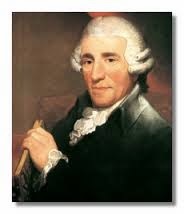 The classical era German composer, Franz Joseph Haydn, is also one of my favorite composers. Haydn along with J.S. Bach, may be the top two most influential and important composers for the development of classical music and beyond [even today]. He is the father of the classical symphony and he was ultra prolific with his composition of 104 symphonies. Because of this, Haydn was known at the time [and still is] as "Papa" Haydn. The theme of Haydn that Brahms uses in his "variations" is called the "Chorale St. Anthony". Because of this, Brahms work is sometimes called the St. Anthony Variations. Brahms scores the variations in B Flat Major. It is a simple but beautiful melody. It is a mesmerizing theme, that once you hear it you may be humming it to yourself long after you hear the piece. 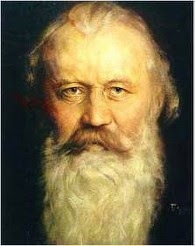 Brahms borrows Haydn's theme and creates 8 variations. So, there are 10 movements: the original Haydn theme, then the 8 variations, then the finale [where the original theme of Haydn comes back]. That is standard in almost all pieces with the theme and variations form. You will have an original theme, followed by variations of that theme, coming back to the original theme at the end. You might wonder if it is wrong for Brahms to take material from Haydn, and to compose a piece of music with his name on it. Well, this is different than someone extracting material from a book of a different author to use in his own work. That would be plagiarism. In classical music, to use another composer's material is not only not wrong, it is the highest form of flattery. Brahms is not stealing Haydn's work for his own self glory. He is borrowing a theme from one of Haydn's compositions, to honor the great composer Joseph 'Papa' Haydn. There is no theft going on here; just love. I think you will agree with me the opening of the orchestral version is one of the most pleasant openings you will ever hear. As I always say, please turn up the volume and enjoy both versions of the wonderful St. Anthony Variations, by Johannes Brahms. Thank you, Michael for the recognition! I really appreciate the diligence and work you put into your posts. I always look forward to them and learn so much from you. This is lovely listening to on this rainy, stormy Pacific Northwest night! Thank you Carolyn. It is because people like you and Joel that I continue to do my classical music posts. I thank you for reading and listening! Blessings, Carolyn.